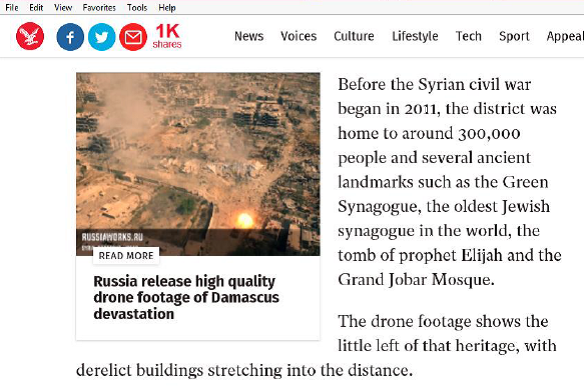 The British newspaper The Independent has been caught parroting Syrian propaganda about the (now destroyed) Jobar synagogue near Damascus, claiming it is the oldest synagogue in Syria. Adam Blitz blogged an open letter in The Times of Israel to set the record straight. Which “Jewish synagogue” is Mr. Atkin referring to? There is no such reference to a “Green Synagogue” at Jobar. The Jobar synagogue was one of many medieval monuments to revere the Prophet Elijah, the Hebrew Eliahu Hanavi or Arabic Al Khodor* and to attribute a cave within the synagogue complex to the prophet. Folklore, built upon the biblical tales (1 Kings 19 v 8) may have its charm but few would accept that the site originates from the reign of the Israelite Ahab circa 850 BCE or that it is any older than the “Elijah caves” of Latakia, Homs, Aleppo and Haifa.